1. Heat your gas or charcoal grill to medium-high. 2. Rub the Cracked Black Pepper Rub on all sides of the chop. 3. 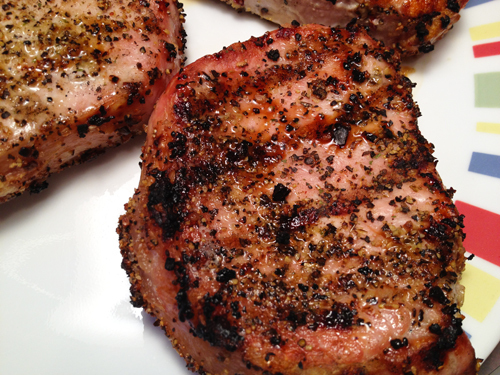 Place the pork chop on the heated grill. 4. Cook the chops 5-6 minutes per side - they will be somewhat firm to the touch. If you use an instant-read thermometer, insert it horizontally into the center of a chop and cook until the temperature registers 155°. 5. Take the pork off the grill and rest lightly covered for 5 minutes. Serve with your favorite vegetable or starch.